Reading restaurant reviews in newspapers and magazines the list of restaurants and cafes we want to try in Wellington currently appears endless! We felt we hadn’t had a ‘nice’ dinner for a while, so booked a table at Charlie Bill. A compact and bijoux restaurant, we received a warm welcome from Leigh and chose our table. It was a wet Wellington night and the dining room felt on the cool side, yet pleasant and intimate with a lovely ambience. I started with Scallop and Prawn Ravioli with olive and orange salsa and, as seems to be the tradition these days, one large ravioli arrived (my Italian Nonna would turn in her grave- one ravioli, indeed!). Subtle flavours could not compete with the butter used and although I love butter I would rather enjoy the flavours of the orange and olives as anticipated. 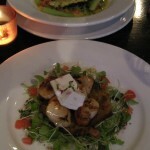 The Kiwi enjoyed the special starter of Scallops with Feta and hash brown, the scallops cooked to perfection. The main of Grilled Beef with Shitake and pink peppercorn dumpling was melt in the mouth delicious, although again it was also devoid of mushroom flavour. The Kiwi enjoyed his lamb dish. into the price the cost of seasonal vegetables into their meals? BYO sweetened the bill. 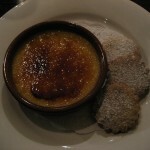 Fortunately a delicious, light Lemon creme finished off the meal, a zesty creme brulee served with Russian tea cakes. Charlie Bill is a nice place with a nice welcome and nice food but is possibly a bit confused about it’s identity. I would love this to work, it’s in a great location and seems to be frequented by regulars from what we saw, but a Bistro by it’s nature (certainly in Europe) is a reasonably priced restaurant, yet here you are charged for “fine food”… I don’t think that “Bistro” and “Fine food” go together – be one or the other. 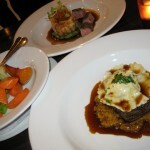 As a bistro the food is great, as a fine food restaurant I don’t feel it hits the mark, or justifies the prices. We saw, we conquered, we will continue with working through our list. Tagged with Charlie Bill Fine Food Bistro, Dinner, New Zealand, Restaurant, Review, Thorndon, Wellington. Thanks for sharing… my husband and I had an almost identical experience at Charlie Bills! I had heard rave reviews from a friend and was keen to partake in the deliciousness. We had a lovely evening (also a little on the cool side) and the food was ‘good’ however I left feeling slightly unfulfilled. Although, the service and ambience were exceptional! Thanks very much for your comment. I like your description of “feeling slightly unfulfilled” – well worded!